One of my favorite parts about taking jewelry classes or reading jewelry-making blogs and magazines is learning new ways to do jewelry-making tasks and techniques that I already know. It's fun and enlightening to see the unique ways that others do common tasks. 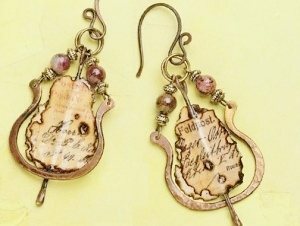 That's why I chose this mixed-media handcrafted earrings project to share with you, from the newest issue of Handcrafted Jewelry. 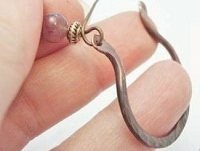 Luthien Thye incorporates unique methods for annealing metal and aging papers in her lovely earrings project. You can make the earrings just like she did to master the techniques; then branch out to create your own designs. The shape reminds me of violins–wouldn't sheets of music be pretty inside? These unique earrings were made by creating metal earring frames, then suspending antiqued pieces of ephemera inside them. * An incense stick is recommended instead of a flame because you can achieve better control of the burn. 1. To anneal the wires, use the chain- or flat-nose pliers to hold a 3" piece of 12-gauge wire in a torch or over a gas stove to evenly heat the wire until it turns red. Quench in the bowl of water. Repeat using the remaining 3" piece of 12-gauge wire. Anneal in a well-ventilated area. 2. Form the frames: Bend one 3" piece of 12-gauge wire around the pipe into a rough 1" circle. 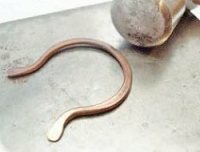 Use round-nose pliers and your hands to open up both ends of the circle and bend them away from the circle to create a horseshoe shape. Repeat using the other 3" piece of 12-gauge wire. 3. Texture the frames: Place the wire on the bench block and use the flat end of the ball-peen hammer to hammer both frames until flat, making the ends slightly flatter than the rest of the frames. 4. Use the round end of the hammer to lightly hammer the frames to add texture. Stack one frame on top of the other to compare the shapes. If necessary, anneal one frame again and reshape to match the other frame. Use the metal file to smooth any sharp edges. 5. Use the hole-punch pliers to punch a centered hole 1⁄16" from each end of both frames. Use the sandpaper to lightly sand the frames. Apply wax to the frames; let dry. Use a soft cloth to buff the frames. 6. To stain the paper, pour the water out of the bowl and refill it with 2 cups of hot water. Mix the ground coffee with the water. Place the sheet of white paper into the mixture, making sure it's fully submerged. Remove the paper and lay it flat; let dry. Don't soak up excess water. If desired, repeat entire step using the same piece of paper for a darker stain. 7. Scan and edit the ephemera: Use the scanner and computer to scan the ephemera. Open the image in your photo-editing software. Adjust the image so the resolution is 150 pixels or higher. Make sure the image is at least 6 x 6". Print the desired image onto the coffee-stained paper. 8. Place the wire frame over a section of the printed image. Use the pencil to lightly trace the inside of the frame onto the paper. Repeat three times. 9. Cut out the traced shapes with scissors. Erase any remaining pencil marks. Place each paper cutout in the center of the metal frame to make sure each one fits inside the frame; trim if necessary. 10. Use the incense stick to singe the edges of the cutouts. If your printer is ink-jet, spray the singed cutouts with fixative to seal the ink. Let dry. Use the paintbrush to apply varnish to one side of each cutout; let dry. Repeat on the other side of each cutout. 11. 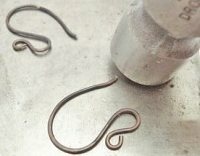 Prepare the metal charm bases: Repeat Step 1 using the 16-gauge wire. Use the metal file to smooth any sharp edges. Place the wire on the bench block and use the flat end of the hammer to flatten 1/2" of one end of the wire; repeat. 12. Assemble the charms: Place one cutout lengthwise under the center of a metal charm base, then line up another cutout on top to form a stack. Make sure the flattened end of the metal charm base extends 1/2" from the bottom of the cutouts. Use white glue to adhere the backs of the cutouts together, sandwiching the metal charm base between them. 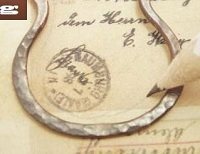 Use round-nose pliers to form a simple loop on the unhammered end of the metal charm base. Repeat entire step. 13. Apply the resin: Mix equal amounts of each part of the resin in the plastic measuring cup, using the measurements on the side of the cup for accuracy. Stir for 3 minutes using the craft stick, remembering to scrape the sides and bottom of the cup. 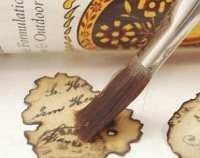 *Use the craft stick or paintbrush to apply a coat of resin on both sides of one charm, including the flattened part of the metal charm base. Use the loop on the metal charm base to hang the charm somewhere in your work space where it won't touch other objects. Place scrap paper underneath the charm and let excess resin drip to form the teardrop shape at the tip. Let dry. Repeat from * for the other earring. 14. Prepare the ear wires: Repeat Step 1 using the 18-gauge wire. Holding both pieces of wire together, use round-nose pliers to form a simple loop on one end of both wires. Continuing to hold the wire pieces together so that they are identical, form a 3⁄16" loop just beneath the previous simple loop on both wires to form an S shape. Form a 1/2" loop just beneath the previous loop to form the hook for the ear wires. Slightly bend the end of the hook away from the loops and trim. 15. Place one ear wire on the bench block and use the flat end of the hammer to slightly flatten it, making the ends flatter than the rest of the wires; repeat. Use the metal file to smooth any sharp edges. 16. Add beads to the frames: Use an eye pin to string one spacer, one round bead, and another spacer, then form a simple loop that attaches to one end of a frame; repeat using the same frame. Repeat twice more to attach two beaded links to the other frame. 17. 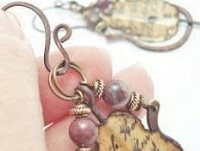 Attach the ear wires and charms: Use two jump rings to attach the free end of one of the beaded links on a metal frame, the simple loop at the end of one charm, and the free end of the other beaded link on the same frame to one ear wire, crossing the jump rings before closing them; repeat. 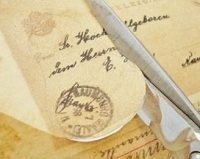 Editor's note: To save some steps, skip the coffee staining, scanning, photo editing, and printing steps by using original paper ephemera. To be able to reuse one design, however, you'll want to scan the original and print duplicates. Also, if your ephemera isn't old, you can achieve that look by coffee (or tea) staining the original. Now you know how to anneal metal using a gas stove (who knew?) and to age paper ephemera for your mixed-media jewelry designs. Want to make Scrabble tile jewelry? Paper beads? Textile and clay jewelry? Be inspired and learn to make more mixed-media jewelry using fabric roses, game pieces, dice and Dominos, feathers, chandelier crystals, bullet casings, candy wrappers, buttons, old T-shirts, vintage postcards, faux enamel, and more in the fun biggest-ever issue of Handcrafted Jewelry magazine! About the designer: Luthien Thye is a mixed-media artist from Malaysia who focuses on jewelry and handmade books. Inspired by old-world explorations and steampunk alternate realities, she's a published artist and blogger. Visit her AlteredAlchemy.com blog or her Facebook page Facebook.com/alteredalchemy.